MainAll NewsDefense/Middle EastTrans-Israel Baja Rally Friday! 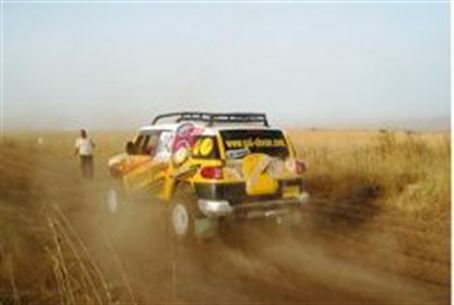 Israel's Trans-Israel Baja Rally will kick off Friday taking competitors from the northernmost Golan to Eilat. About 250 competitors will participate in the "Trans-Israel Baja" off-road race on Friday morning. The race, from Kibbutz Merom Golan in the northernmost Golan Heights to the hotels in Eilat, will kick off at 04:00 Israel time and will end in the early afternoon. The route is some 700 km and contains five sections wherin navigation will be challenging and competition fierce amidst extremely difficult terrain. Over 100 vehicles, including motorcycles, the Space Group "Space Buggy," Jeeps, SUVs, and various all terrain vehicles will compete. As in previous years the competion will include a separate "RAID" category comprised of standard vehicles scored on precision navigating without intermediate sections rather than overall time. The RAID category is considered a good alternative good way for those who want to taste the motor sport, but in a less competitive fashion. Director General of Tourism at Kibbutz Merom Golan, Cioffi Moore, said in an interview with Israel National News that the "Trans-Israel Baja is an unparalleled event in terms of the challenges it puts before the teams participating." "There is nothing more natural than to drive Israel from north to south," Moore said.